Located within a Kentish walled garden high in the centre of the Kent Downs AONB, our Stable, renovated over four long years is now available for both long and short stays. It is ideally located to explore the central Kent Downs or the Weald. Canterbury, Whitstable, Maidstone, Ashford, Rochester and the channel tunnel terminal are also all no more than 25mins drive. The stable is part of the coach house, built in the 1800s to serve the local manor house. The L-shaped main building is made up of two distinct wings. The western wing (where the owners reside) was the coach house & staff quarters, and the south wing (the guest accommodation) was the stable & hay loft. Together with the old cart lodge and a much later garage block, this cluster of buildings around a Kentish walled garden forms ‘The Coach House’. Guests have sole use of ‘The Stable’ - a self contained 2 bedroom cottage with so much space that part of the open plan ground floor can be utilised as a dual function dining room/3rd double bedroom for larger groups. The Stable has a private entrance which opens directly to a stunning 35 foot/11 metre living space with heated limestone floor and brick inglenook fireplace with log burner. At the entrance, tucked behind a curving wall framing a Victorian spiral staircase is a bespoke, fully integrated solid oak kitchen and breakfast bar on a raised brick floor. The ground floor of The Stable can be configured in 2 ways - enabling it to cosily host couples or small families, and retain the capacity to comfortably sleep up to seven adults. Please see the ‘other things to note’ section for the detail. The bedrooms are also stunning - they both have solid oak doors, floors, beds, beams, and totally bespoke integrated oak furniture and lighting. From the twin, the master bedroom is accessed via a corridor off which is also the bathroom. The master also features a king size bed and work desk. The travertine bathroom is also a wet room with underfloor heating, open waterfall shower and whirlpool bath. Private use of the stable cottage and outside brick terrace. There is lots of parking space. Access from the car park to the enclosed courtyard and residential area is via 19th century cast iron gate. Brick walkways lead to the holiday cottage. We'll be available if you need us, we live in the adjoining cottage with our Labrador, which is confined to an enclosed courtyard if outside. The ground floor of The Stable can be configured in two ways; for groups of 1-4, and for groups of 5-7 (both configurations are in the photos). This is done by adding space and furniture to the ground floor. For smaller groups, the lounge contains 2 sofas and the space behind the horse stall divider contains a dining table and bookcase. See the 1st set of ground floor photos for how it looks in this configuration. For larger groups, the bookcase relocates to the lounge, an extra sofa (sofabed) is added to the lounge, and a full size oak double bed, storage chest and bedside table is added to the space behind the horse stall divider, and a 2nd bathroom is also added. Thus, when dining is done, a curtain above the horse divider can be drawn to create a 3rd bedroom with ensuite. See the layout for 5 and more for how it looks in this configuration. Spiral staircases may be a potential hazard for very young children, and tall guests (significantly over 6' or 1.80m) may find headroom limited in the upstairs bedrooms due to the sloping ceilings and beams of a space that started its life as a hay loft. Guests can arrive anytime after 4pm. Checkout is before 11. There may be flexibility, dependent on previous or follow on bookings. Mobile phone reception is patchy. Calls can normally be made or received outside with most networks. Wireless internet access is available in the cottage, it is broadband, however please don’t expect town or city download speeds. Our friendly and very quiet young female Labrador is restricted to the owner’s separate secure courtyard. If guests are planning on walking in the woods, we advise using walking shoes/boots and jeans. Some of our local footpaths through woods are infrequently used, can be muddy in spring and in summer have brambles or nettles encroaching on the paths. A light breakfast is left for all guests checking in. This is for the first morning only, it is not provided every day. As an optional extra, we can offer a fully prepared external barbecue (between June and September). This consists of a ready to light external fire pit BBQ with grill, and includes a meat pack from Doddington’s award winning butcher, SW Doughty, home made bread and home prepared salads. The cost is £15 per person, just ask when making the booking. If, close to arrival, the weather forecast is poor, a booked BBQ can be cancelled up to 24hr before check in. For small groups (max. 4), we offer a pick-up and drop-off service to the nearest stations (Lenham and Sittingbourne). Please enquire prior to booking for availability and availability. We supply free of charge a basket of logs for the log burner. If you need more logs we can sell them by the basketful for £6. Please enquire if you would like to bring a pet. There is an additional cost of £15 per night to cover the added risk and additional cleaning. Maximum two pets. My partner Graham and I are a friendly Anglo-French couple who live in the other wing of the house. Although, especially if using the self checking facility and staying a short time, you may not actually meet us as we both work full time. However, we will generally be around in the evenings and weekends to greet people arriving, answer any questions, sort any issues, or just provide some help if you are planning one of the many local ‘pub walks’. The location is this property big asset. While it is set in an area of natural outstanding beauty (AONB), is a magnet to the local wildlife, and is peaceful and quiet, it is also only 20-30 minutes from the cities of Canterbury, Rochester, and 1h-1h20 on the train to London. Several footpaths cross the local area, just ideal for walkers. toilet, shower, jetted tub, shower with no enclosure, this is a wet room. toilet, shower, Made available for group of 5 and more only. kitchenette with breakfast area sitting two persons. HD TV large screen smart television, Netflix accessible. no satellite or cable but TV is connected to the internet and can stream content from the internet. Netflix is also available. We have just had a lovely 4 night stay at this beautiful property. There were 7 of us and a dog and everything had been thought of to ensure we had brilliant time. Beatrice brought a warm Brioche and homemade jam and butter to greet us. The smell alone was wonderful. The underfloor heating was on which was great after taking off our boots on a late October evening and there was even a small jar of dog treats for our dog Maria and a welcoming play with the friendly black lab Maya who lives there. The whole place has been completed to a high standard but is also very practical. We enjoyed watching netflix on a huge TV in front of a real log fire while sipping chilled wine or cider. We roamed over fields and through woodland on lots of public footpaths and ventured down narrow country lanes to have a wonderful meal at the Plough - again recommended by Beatrice. Despite being in the middle of the countryside it does not take long to get to different towns and places of interest. However one slight challenge is finding Sittingbourne if you follow the road signs, as every road appears to lead to Sittingbourne but you never seem to get any closer! What a beautiful cottage! The design has been very well thought out and beautifully executed! Beatrice was the perfect host and made sure that we were comfortable and had everything we needed. The breakfast bread and preserve was delicious. We purchased the BBQ packs, unfortunately the weather didn’t play along, but we were still able to cook the food in the well equipped kitchen. The food, and especially the hot bread, was all delicious. The cottage was well equipped, very clean and with comfortable beds! I wish we’d been able to stay longer..... we will definitely be back for a longer stay when we’re in the area in the future! We have booked this amazing cottage for 1 night only as we were passing by. Ideally located in a charming setting, the cottage has completely won our hearts. Very easy to find, it is so comfortable, luxurious, spacious and clean. The hosts couldn’t have been more welcoming. We were really touched by the home made brioche and jams brought to us on the morning by the hosts, so delicious! We particularly enjoyed having our breakfast on the terrace whilst listening to the birds... idyllic break! We will definitely book again and stay for longer! What a lovely place, a little country heaven. I staid at the Stable with my husband and 15-month old son and thoroughly enjoyed it. Well equipped cottage, very clean, cosy, perfect for families. All the basics are provided, the welcome breakfast in a basket was a nice touch. Some books are available to give you all the information you need to explore Kent. Great location to explore central Kent or nip to London for the day. Beatrice, our host, gave us such a warm welcome and was very helpful throughout our stay. Sehr angenehme Wohnung und herzliche Gastgeber, die mit Rat und Tat zur Seite stehen. Wir haben es genossen. Very comfortable House and very friendly host. 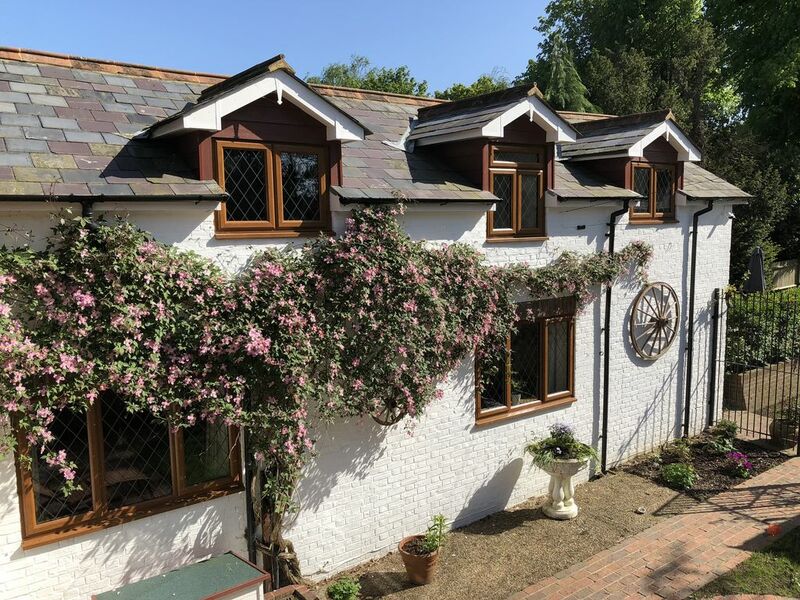 Though located in the centre of the Kent Downs AONB (area of outstanding natural beauty), the cottage is still only 30 minutes from the Channel Tunnel Terminal, making it ideal as a stop over for those travelling to the continent. It is also an excellent base for those wishing to explore the Kent Downs on foot. Places to visit / attractions less than 5 miles away counts Leeds castle, Doddington place, Belmont House and gardens. National trust places to explore further away: Sissinghurst castle, Scotney castle, Bodiam, Hever castle, Chartwell. Animal reserves: the big cat sanctuary, Port Lympne Reserve, Wildwood , Howletts Wild Animal Park, Wingham Wildlife Park. The cottage is equi-distant from all the main and historic towns of mid-Kent. Canterbury, Maidstone, Whitstable, Tenterden, Faversham, Ashford and Rochester are all only 20-30 minutes away. The nearest village/pub is 1 mile away. Public footpaths extend in every direction from the cottage making it very easy to explore the many winding lanes, bridleways, footpaths and dry valleys that are the hallmark of this AONB. Almost all footpaths and bridleways eventually lead to a decent country pub, making for some great walks. Guides to the best walks via various country pubs serving good food can be made available for visitors. The nearest railway stations are Lenham (3 miles) or Sittingbourne (5 miles). To Sittingbourne it is under 1hr from St Pancras International, to Lenham it is 1h20 from London Victoria. Getting here is best done by car. Once here, getting around is best done on foot.